This was not as long a book as it might be seem if you judge by the time between my first and last post, but there is a lot to mull over and I preferred to take my time reading and thinking. 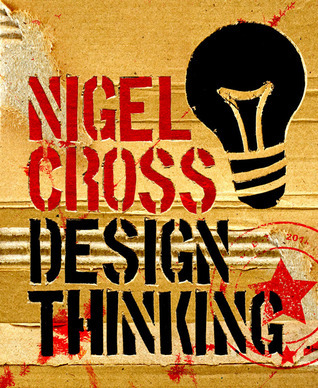 As was stated in my other post on this book, this is not an exploration of a simple paradigm for teaching folks how to think about design; it is more a review of research into what top designers actually do. As someone who is looking at ways of teaching design thinking to my students, I find this an interesting balance and one that I, with previous experience as a performing and composing musician, can completely relate to. There is a difference between what we are taught to do and what we actually do. What I like about the d.school model is the way that it allows design students to focus on particular aspects of the process and develop ways of thinking that serve each. While experts will blur these phases and likely won’t step back and say, “I can’t think like this right now. I’m in ______ phase!”, they will move between these ways of thinking fluidly to make the ways of thinking serve their purpose. The student needs to develop a conscious awareness of these thought processes before they will serve their purposes at a high level of fluency. I can’t help but think back to my time as a composer. I tended to write more in what people would consider a classical vein. I don’t recall any discussion of design thinking with my teachers, but this process aligns very nicely with what I should have been thinking and the way I spoke to my students about composing. You have to establish your framework before you write your first note. The better the ‘problem’ is defined, the easier the piece is to write. As a student though, I thought that freedom was what I was really seeking. I wanted the freedom to write what I wanted to write (without actually taking the time to define what it was that I wanted to write in the first place!) I suspect that this lack of definition is where 90% of writers’ block comes from. I’m looking forward to digging in more and the opportunities that I have to teach design thinking as I move forward with a new program at my school. Cross’s ideas of process and of the specifics of ways of thinking (the ideas of deductive, inductive and abductive reasoning still resonate with me) will serve me well. If you are looking for a clear cut method to teaching design thinking, this book is not for you. If you are willing to wallow in the messiness of what high level designers do, look at parallels between problems and mediums, and dig into the depth of research that Cross presents, you will certainly get as much out of Cross’s work as I did.